COUNCILLOR Matthew Pennycook has today announced his resignation to the Chief Executive of Greenwich Council. The move means that a by-election in the Greenwich West ward can now take place on the same day as the General Election in which Pennycook is standing to be the MP for Greenwich and Woolwich. Cllr Pennycook's letter to Chief Executive John Comber says it has been an "enormous privilege" to serve as Greenwich West councillor but he has decided now "is the right time to stand down from the council in order to avoid the costs which might arise if a by-election has to be held after Thursday 7 May." Pennycook was first elected as a councillor in 2010 and then re-elected at last year's elections. He was selected in December 2013 to be Labour's candidate at the General Election after incumbent MP Nick Raynsford announced he wouldn't be standing again. The General Election takes place on May 7th. I am writing to let you know that I have decided to stand down as an elected member of the Royal Borough of Greenwich with effect from today. As you know, my normal term of office ends in 2018. However, I have decided that now is the right time to stand down from the council in order to avoid the costs which might arise if a by-election has to be held after Thursday 7 May should the people of Greenwich and Woolwich give me the honour of electing me as their Member of Parliament at the forthcoming General Election. It has been an enormous privilege to have served the residents of Greenwich West ward over the past five years and I’m incredibly proud of everything that we have been able to achieve together during that period. I very much hope to have the chance to continue to serve the area and its residents in the years ahead. Lastly, can I thank you for your support during my time in office and ask that you please pass on my sincere thanks to the dedicated officers with whom I have worked over the past five years. Their support, advice and commitment to making our Borough a better place in which to live is appreciated enormously. 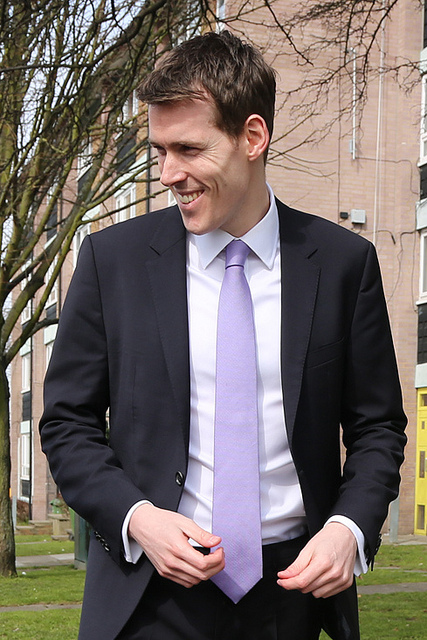 Sorry to lose 1 of my fantastic #Greenwich West council colleagues, @mtpennycook, but hope to gain him as my M.P. on 7th May. Mixed reactions to Labour's Matt Pennycook resigning today 'in case' he's elected MP. Some say 'arrogance', others 'fair'. I say 'chutzpah'. Plans to partially pedestrianise Greenwich town centre will not be going ahead, Greenwich.co.uk can reveal. The proposal, which included pedestrianising College Approach and King William Walk while creating a new gyratory system around Norman Road, Creek Road, Greenwich Church Street, Greenwich High Road, has been put on hold indefinitely. News of the decision to halt the project, which was put forward by the council after consultations held in 2009 and 2010, was revealed through an exchange of letters between Council Leader, Chris Roberts, and local ward councillors Matthew Pennycook, Maureen O’Mara and David Grant. The Greenwich West trio, who have undertaken their own consultation, say that the scheme should be “suspended for the foreseeable future”. “We feel that our focus at the present time should be on introducing measures to address the existing traffic/rat running problems in residential streets in West Greenwich and … any temporary traffic management that may be required to facilitate pedestrian access through the town centre during the Olympic Games”, their letter adds. He also says in his letter that TFL have raised with him a desire to "engage in public consultation later in the year" on traffic proposals that will "directly affect areas of the borough to the east of the Town Centre." Click here to read the full letter from Greenwich West councillors to the Council Leader, Chris Roberts and his reply. The decision to suspend the scheme, which the council still describes on its website as one that would “address the needs of local residents and visitors whether on foot, on bicycle, or on public transport”, is a victory for residents concerned that the gyratory would increase rat running in the area – concerns which led to separate traffic calming measures in West Greenwich being proposed. Greenwich Council appointed highways and traffic consultants, Hyder Consulting, to work on the project in May 2009 but declined to answer a Freedom of Information request last year from local journalist, Darryl Chamberlain, asking how much the company had been paid for their work on the scheme. 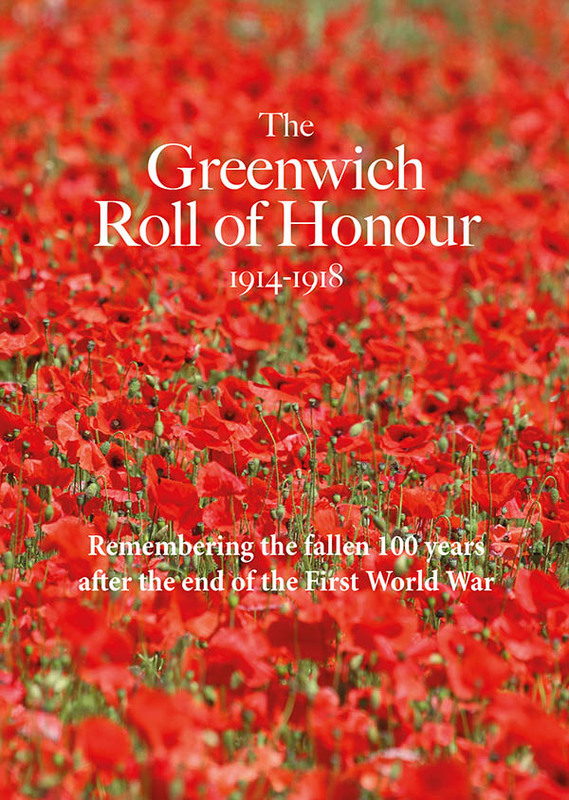 The following article was posted by Cllr Matthew Pennycook on the Greenwich West Labour website and he has kindly allowed me to reproduce it here. Last night West Greenwich residents held a meeting in the Prince of Greenwich public house to discuss traffic-calming measures and the Greenwich Town Centre (GTC) pedestrianisation proposals that will come before the Council's Cabinet in the New Year. As local Councillors we were invited to come along to speak at the meeting. Residents raised a variety of questions about traffic-calming measures that could be introduced to deal with the problems that already face residents in the West Greenwich Conservation Area. The potential impact of the GTC pedestrianisation proposals on nearby residential streets was also discussed. As local representatives we apologised for any confusion that had arisen out of a small meeting Council officers held with key stakeholders and Resident Association representatives on 28th October. Local Councillors could not attend the meeting due to prior commitments. It was designed primarily as an opening discussion of plans to address the serious issues of rat-running which residents have raised with us and officials over many months. However, during the meeting residents were told by Council officers that a firm date and decision-making body for the proposals had been agreed upon. This was incorrect and as local Councillors we have taken firm action through the Council Chief Executive to ensure that a similar situation does not happen again. During the meeting we made clear that there have been two public consultations on the GTC pedestrianisation proposals (Dec-Jan 2009/10 and July 2010) both of which were advertised in the Council's freesheet Greenwich Time and on the Council website (a copy of the Council's advertisement and questionnaire can be found to the right hand side of this page). The Council also held an exhibition in Devonport House where residents could question Council officers on any aspect of the proposed scheme. In addition we explained how as local Councillors we had fought for an extension of the consultation period after July 2010 in an effort to get further feedback from residents. During this period we personally hand-delivered a non-political leaflet on the proposals to every household in the Ward. This leaflet contained our contact details and a freepost tear off slip so that residents could easily let us know their views or get in touch with further questions. From this additional round of consultation we received 30-40 responses from residents across the Ward including those on Crooms Hill, Prior Street, Circus Street, Gloucester Circus, Royal Hill and many more. We reiterated that the Council is wholly persuaded of the case to address traffic problems in the West Greenwich Conservation Area and made clear our intention to implement an appropriate scheme in full consultation with local residents irrespective of whether any scheme of pedestrianisation proceeds or not. Council officers in attendance explained that traffic modelling data made available on the 28th is part of an iterative process and information on the potential impact of the partial pedestrianisation on traffic in nearby residential streets will continue to be utilised as the details of the scheme evolve in our discussions with local residents and businesses. They also informed residents that the Council is continuing to work with Transport for London who have been engaged at each stage in order to ensure the arrangements for bus routes (including stops) are properly assessed. We were at pains to clarify that no timetable for a decision on the partial pedestrianisation scheme has been set, not least because Council officers continue to work through the traffic implications of such a scheme and to consult with those businesses and residents who would still require some vehicular access to pedestrianised streets under the proposals. A decision on the pedestrianisation proposals will be taken in due course by the Council's Cabinet. This will be a public meeting at which members of the public will, subject to appropriate time constraints, be welcome to speak and make representations. We assured residents who attended that full information on the traffic impact of the pedestriansation proposals and changes to bus routes and stops will be made available to the public for informed input into the decision-making process and to Cabinet members to make their decision in due course. A group of campaigners gathered outside Greenwich Market on Sunday to protest against proposals to redevelop the market. 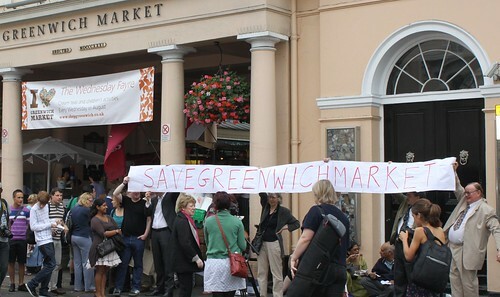 Car drivers honked their horns in support and a crowd gathered to watch as demonstrators held their "Save Greenwich Market" banner aloft outside the College Approach entrance to the market. The demonstration organiser, Cllr Maureen O'Mara, was joined by her fellow councillors for the Greenwich West ward, David Grant and Matthew Pennycook, and concerned local residents. Some stall holders and shop owners from inside the market also came out to lend their support. Plans to redevelop the covered market and add a new boutique hotel were rejected by Greenwich Council last year but could still go ahead after owners, Greenwich Hospital Estate (GHE), appealed the decision. The market is under the threat of complete demolition. GHE want to put a hotel here and I've got arguments about that but my whole principle about this is that the market is a much loved part of london. It's one of London's jewels and people come here every weekend - they love it and enjoy it. I think what GHE wants to put in its place is just a homogenised view of London. The hotel that features in our regeneration plans will be a welcome addition to the town centre and not a threat or competitor to the market - rather it should provide additional custom for our traders. Campaigners are planning another demonstration to coincide with the start of the Planning Inspector's inquiry next month at Woolwich Town Hall. 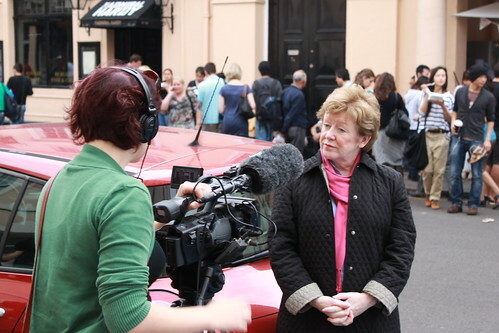 Councillor Maureen O'Mara being interviewed about the protest. Concerned children from a Greenwich primary school have met with the landlord of a neighbouring pub to call for improvements to their local area. 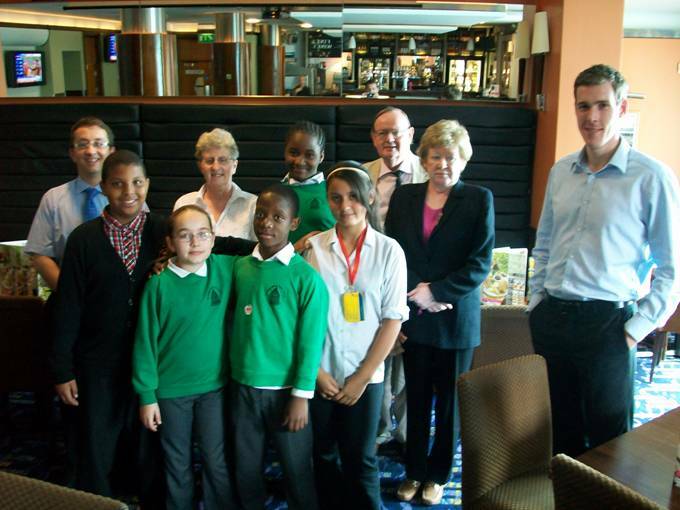 Pupils from St Alfege with St Peter’s Church of England Primary School, along with their headteacher, Hazel Burnie, met with Sean Brogan, manager of the Gate Clock in Creek Road. 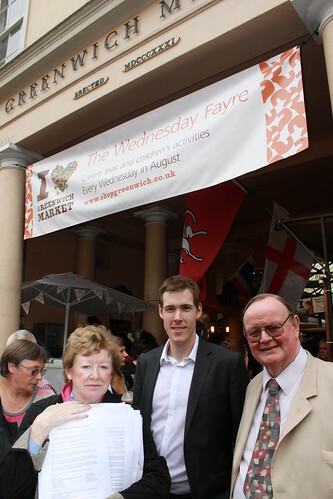 They were joined by all three Greenwich West ward councillors - Maureen O'Mara, David Grant and Matthew Pennycook. A plan was agreed which includes the Gate Clock pledging not to sell alcohol off-licence to be consumed outside the premises, a bigger effort to deal with litter and a promise to remind customers that areas near the pub are part of a 'no drinking zone'. The children’s work is part of South London Citizens’ CitySafe campaign, a community-led response to crime and the fear of crime in the capital.